This created an anime-sized bead of sweat on my forehead. You see, board games aren't like video games. You want to know if a video game's coming out, you call a guy who works in a place, or perhaps do a Google. Board games? Oh, man. You call the game shop. They've never heard of it. Neither has their system. If you're lucky, Googling informs you that the outsourced Chinese manufacturing solution/team have said they'll be putting the first print run on the boat to the Spanish warehouse in "some months". You find the number for the Spanish warehouse. "Qué?" answers the foreman. You panic. You don't speak Spanish! Thinking quickly, you fling the phone out of the window. No word of a lie: I once spent two years—2010 and 2011—waiting for an expansion for one of my favourite games to be reprinted. Two years! And guess what? When I finally got it, I hated it! Here, then, is my list of Top Board Games Coming In 2013, Or Maybe 2014, & Some Technically Came Out In 2012. Know what the worst part is? In sharing this list, I'm just increasing the chance these games will sell out before I get them. URGH. 2010 saw the release of K2, a terrifying(ly AWESOME) board game where players race to the top of the world's deadliest mountain in the world's slowest, coldest game of chicken. Playing various cards from your own private deck to either "Advance" or "Acclimatise" feels like climbing hand over hand up a slippery cliff. The game ends with a great piece of theatre where the players who actually reached the summit inevitably die of cold and come in last. Hooray! The Polish designer, Adam Kałuża, is releasing his sequel this year. The Cave is the same risk/reward kind of race, except for caving. And so will inevitably see people the world over howling at their dining table as their little wooden explorer slips and drowns in a freezing underground lake. What's interesting is that, unlike K2, where the mountain is visible from the start, The Cave sees players exploring a cave of randomised tiles with no idea what's coming next. Does it work? Apparently. Kałuża calls K2 a "9", but The Cave a "10", which is reason enough for me to set my Excitement dial to Engorged. Alternative 2013 Excitement: Myrmes, which is also set underground, but you're controlling a colony of ants. Ironically, Myrmes looks like a much, much heavier game. Cannot wait to get my spindly hands on this one. Along the lines of Spaceteam and Artemis Bridge Simulator, Space Cadets is a board game that sees 3-6 players jointly controlling a Star Trek-style ship, where everyone's "console" is a unique board game that feeds back into everyone else. Imagine you and your friends, all looking noble in the tight monochrome t-shirts you insisted they wear for the occasion. Has the Helmsman flown you into some asteroids? No problem. Oh, Engineering didn't allocate any energy to Damage Control? Oh right. And an enemy ship just locked onto you, but your friend at Weaponry failed to load any torpedos? Right. That's not a problem, because the guy on Shields set the Shields to the front of the ship. What?! HE DIDN'T? At which point everyone looks at the poor sod playing Damage Control, who, as far as I can tell, is about as enviable as being the goalie in soccer. Throw in a crate of beer and I think we might have the gaming experience of 2013. We'll see. Alternative 2013 Excitement: Wok Star is finally seeing a general release, which is awesome, because I missed the first printing when it came out THREE YEARS AGO. Think flying a space ship is hard? Wok Star has you all running a Chinese restaurant together, in real time. Yeah. Another stealth sequel, Kemet looks to be the successor of island-hopping wargame Cyclades. Cyclades was/is a fascinating motherf***er of a game because you can only build or control your armies, fleets and monsters by first winning auctions for the affection of Poseidon, Zeus, Athena or Ares. It's a puzzle-as-knife-fight where everyone can only move one of their limbs every turn. Kemet swaps ancient Greece for Egypt, but looks like yet more strategy that's as lightweight as it is twisty. Most strategy games allow players to either go aggressive or upgrade their people. With Kemet, everyone gets upgraded every turn, but your primary source of victory points is attacking other people. Just relentlessly. All the time. With giant stag beetles. 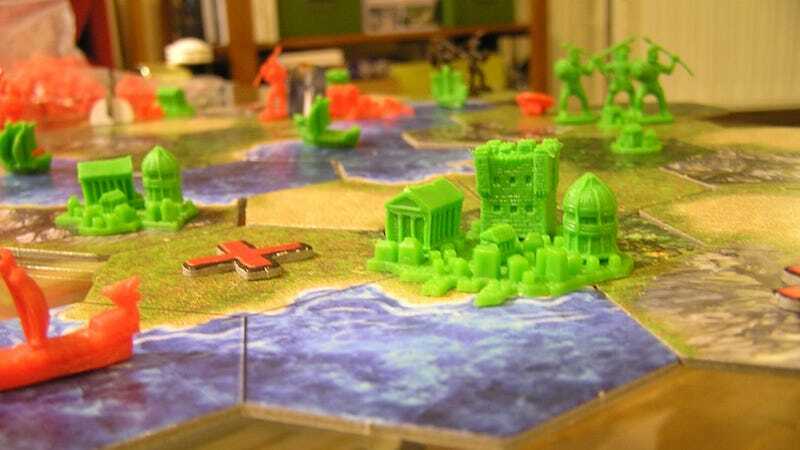 Board gamers reading this may be aware of that irony that lots of war games, in practice, are games of Not Going To War If You Can Help It. Kemet, though? It looks like it wants to hand out bloody noses and black eyes like some sandy Egyptian Santa. Give it to me. Alternative 2013 Excitement: If you prefer your strategy stolid and familiar, Z-Man's Clash of Cultures looks distinctly luxurious. If it does for Sid Meier's Civilization what designer Christian Marcussen did for Sid Meier's Pirates in his previous board game, Merchants & Marauders (which is to say, rip it off elegantly, like a professional waxer), that'll be very exciting indeed. Would you like to spend an evening controlling 1860s New York by manipulating immigrant populations? Don't answer that. First I'm going to tell you how painful it is to be a board gamer. Political / backstabbing / fragile alliance game Tammany Hall was first published in 2007 to critical acclaim, and with a print run of exactly 500 copies. This year's re-release is the result of fans asking the publisher if they could Kickstart a second print run a scant SIX YEARS LATER, so once again, Tammany Hall, this legendary game of slander, bluffing and crunchy strategy will be available. Until it's not again? I don't really know. Honestly, I haven't the faintest idea why this game is so good. I'll still be buying it, obv, but I'm wary that a box that rare has got to give off some kind of contact high. Alternative 2013 Excitement: For a more exotic game of corrupt politics, this year will also see Jolly Roger Games updating similarly revered 1986 political reshuffle game Kremlin. I might be more excited about this than Tammany Hall. Apparently the new art's done in a 1930s Soviet style and you can exile other players to Siberia. Yes please! This one's so hot we don't even have an IMAGE. Yeah!! Yeah. Board gaming. Sorry. Race for the Galaxy is a divisive game featuring just one, enormous deck of cards: A galaxy. In a design of alien intelligence, these cards you draw are your currency, but also your options. As you drop them like comic book panels into your tableaux, your holdings will grow in colour and complexity, hypnotising you utterly, both because of the unique challenge you created and the tiny story you can interpret: The people of your Doomed World migrating to a Tourist World. Discovering an Alien Battleship and using it to gain Galactic Trendsetters. When I say Race for the Galaxy is divisive, it divides people into those who see the game for the work of genius it is, and assholes. Just trust me on this. Anyway, Roll for the Galaxy is coming this year, and it's a dice-building game. This is genre created by 2011's Quarriors, where rather than cards, players acquire an "empire" of unpredictable, tiny, custom dice from a central pool, dice you then don't just draw, but also roll. Very exciting. Hurry up, Rio Grande Games. Alternative 2013 Excitement: RftG: Alien Artifacts, an expansion for the original Race for the Galaxy, is also coming out this year. Apparently. After it was meant to come out last year. HURRY UP, Rio Grande Games. Love Letter is a game of trying to get a letter into the hands of a princess, consisting of just sixteen cards. For this reason alone I need to spend exorbitant money on it. I might be mad. But publishers AEG also call it a game of "risk, deduction and bluff", and apparently it's very sharp indeed. Archipelago sounds similarly perfect. A zepplin of a game, it is huge, gorgeous and heavy with the possibility of going VERY VERY WRONG. Here, players race to colonise a Caribbean archipelago, with the primary twist that the natives will slaughter them if they don't watch their step, and a second twist than one player around the table might be a sympathiser working with the natives. The sun-bleached, capitalist horror of it all. AND I STILL haven't play Andean Abyss, the asymmetrical wargame from GMT I was most excited about last year. Set in 1990s Colombia, the game illustrates the problematic situation by casting one player as the government, another as the leftist opposition, another as the drug cartels and a final player as the right-wing AUC party. The result: An ethical squaredance with everyone working with anyone to get ahead. Too much to play. What am I doing even writing to you guys! I'm outta here. Buy some board games. You'll love it.